You have written your very own book, you have published it, and you have organized the book launch event. Now what? If you expect the sales of your book to skyrocket immediately from its presentation, you might be rather overoptimistic… well, unless your book was written specifically according to the modern literary trends, is tailored to the modern readers’ caprices, and is designed to be sold fast. Then, yes, it might quickly become a bestseller and a crowd of fans might be knocking on your door for autographs. However, if your book is a reflection of your inner world, contains your thoughts and ideas, and is designed to communicate your unique message to the world rather than adapt to it, then there is much more work to do to grow your community of readers. “The Monster: Blade of Darkness” falls in this category of books, therefore I am actively using various means, both on-line and off-line, to keep in touch with its readers and scale up their global community. And in this blog post I will share some of the tips and tricks on how to do it from my experience. Lesson #4: Permanently stay in touch with your community of readers. The Digital Age we live in nowadays offers a multitude of tools to keep in touch with people worldwide. And you can use them to interact with your amazing readers, engage new ones into your community, and grow it. For a start, you can create a blog or a full website with the blog integrated in it for your book. In this way you will be able to inform your readers about your events and progress in writing other masterpieces. WordPress and Blogger offer a lot of quite good and free tools to build an appealing blog / website. For instance, this website and blog you are reading were done in WordPress, while my poetry blog “The Thoughts” was prepared in Blogger. Alternatively, if you have some money to spend, you can order a professionally designed website for your book. But do not limit yourself to your own website. I advise you to write guest posts and articles on other literature-focused blogs and websites. In my case, I mostly post some of my articles also on the blog of serendii publishing, the agency in Austria that published and now distributes the English version of my book “The Monster: Blade of Darkness”. Book Blogs is another on-line portal, where I share my literary news, and which you can also use for staying in touch not only with readers, but also with other writers. Talking about virtual communities of readers and writers, I really suggest you to join them and be active here, as they can become the Cornucopia for your own readers community. Goodreads is one of the largest and well-known ones. You can even find your book there and invite readers to rate it, give you valuable feedback, and suggest others to read it. For example, here you can see how my book “The Monster: Blade of Darkness” with several ratings and reviews looks on Goodreads. Also be very active on social networks. Facebook, Twitter, Instagram, and Pinterest are some of the many social networking platforms that you can use to attract readers and constantly communicate with them. On Facebook and Twitter you can create a page / account of your book and share the updates, like I do it here and here. On Instagram and Pinterest you can share photos of your book and its readers worldwide, just like me here. And why not sending your amazing readers a nice newsletter, where you express your gratitude for them reading your book, kindly ask for valuable feedback on it, and inform them about the latest news and events related to your literary activity. For example, I try to do it every month and on special occasions, but you can choose to send such newsletter more often. And I use MailChimp as a pretty convenient and free tool for that. Last but not least, do not limit your engagement with the readers only to the virtual world. You can organize off-line gatherings within your community, attend various literary events, donate copies of your book to public libraries, and so on. I confess that I have not been very good at that, but I learn my lesson and improve. As I remember that readers are people, who, like all of us, seek attention and care. And they will be very happy to communicate with you if you are proactive in your communication with them. Well, that is basically all I have learnt from my book publishing experience and that I can share with you. Hopefully you have enjoyed this series of blog posts and have found something useful for you to use in your own literary activity. If you have any question or request for me to write about something else from my book publishing experience, please use the Contact section to send me a message. I wish you a MEGA large community of amazing readers of your book worldwide! Note: This is a repost of the article on serendii publishing website. In the previous two articles of the series “How to Publish a Book in the Digital Age” I have described how to attract people to your dream of writing and publishing a book and how to involve them into supporting its realization through crowdsourcing and crowdfunding campaign. This should help you get the support you need to finally see your masterpiece in the form of a shiny new book. I still remember that wonderful feeling when the first copies of my book “The Monster: Blade of Darkness” had arrived. But who knows that you are going to publish or have already published a book? In order to inform people about it and attract the first amazing readers you might want to organize a book launch / presentation event. In this short article I will try to give you some useful tips on how to do it in an effective and cost-efficient way. However, I should mention here that my presentation of the book “The Monster: Blade of Darkness” was pretty much a failure… at least this is how it looked from the external perspective. I did not have any tables full of sandwiches and cakes, waiters carrying trays with wine and champagne, well-known literary critics singing serenades about the book, mass-media doing interviews with the author, etc. No, my book launch event was a small gathering of my best friends in the park among tall trees, singing birds, and warm sunrays. This was done due to such an environment being the most representative for my novel “The Monster: Blade of Darkness”, where the action takes place in a tropical forest among the nature. In addition, the moderation of my book launch event was practically nonexistent. The reason was that I generally do not like when too much attention is dedicated to me, so at the event I got lost from too much “spotlight” focused on my persona. Still, all those mistakes and experience as a whole made me learn some good lessons, which I would like to share with you now. Lesson #3: Organize a Book Launch Event that will reflect the Character of Your Book! In my view the book launch event is a way to show the environment of the book and communicate its message to the potential readers, who see it for the first time. Of course, it is also the marketing approach to promote your creation and attract these potential readers. That is why I find it important that the whole atmosphere and flow of the event reflects the idea, mood, and environment present in your book. For example, if your book is a collection of poems, you can do its launch event in a library or museum of some well-known poet and have in its agenda a contest of reading selected poems from your book. If your masterpiece is written in a fantasy style, like Harry Potter or Lord of the Rings, you can organize the event in some old-looking house or museum decorated with magic-style things featured in your book. You can also include some magic tricks performance in its agenda. 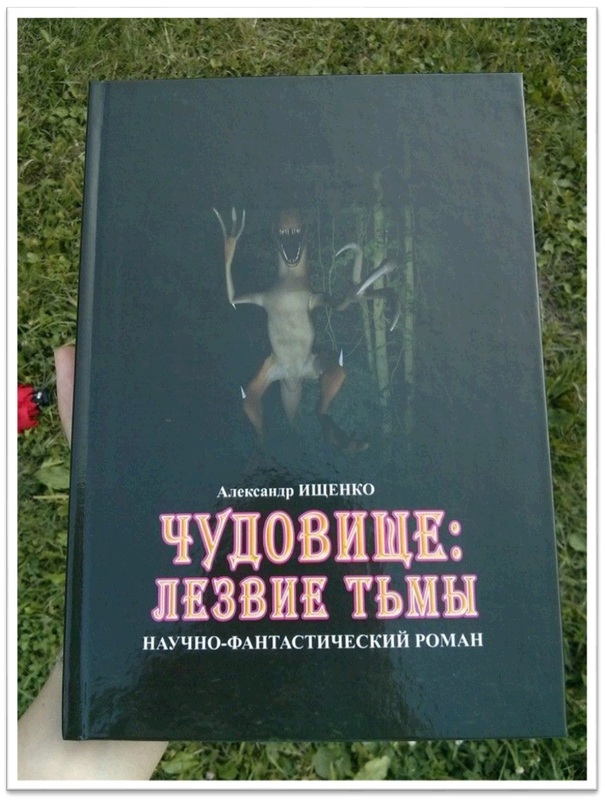 In my case, the book “The Monster: Blade of Darkness” was presented to the readers in a park among the nature – the setting that, in my opinion, communicated its idea and environment the best. It is a very good idea to have a moderator during the whole book launch event. He/she will be able to lead the participants through the event in a logical flow and at the same time take off the moderation load from your shoulders. You can also invite someone to read certain poems / episodes from your book out loud. Both the moderator and the reader(-s) can be your friends willing to help you in such an important and memorable day. Some authors like to invite some well-known literary critics and professors and to pay them for reading their creations and then speaking about them at the presentation event. I think it gives the event quite an artificial look, so I do not advise you to do it. The best thing is if you have a good specialist in literature among your friends, and he/she is genuinely interested to read your book and then come up with his/her opinion and constructive feedback about it. The presentation and speeches are, of course, good, but they should not take too much time. The central point of the book launch event is the signing of the book by its author. You should allocate sufficient time for it and be available for readers willing to get your autograph in their new book. I remember visiting one book presentation event, where the author was so proud of herself that she was mostly posing for the camera instead of focusing her attention on the guests. As a result many attendees left the event disappointed. Finally, while you are busy giving out copies of your books and signing them for potential readers, other guests should be entertained somehow. For this you can put a light buffet and networking time in the agenda, as well as have some music and performance in the style of your book organized in the background. Whatever you choose to do, it should be aligned to the atmosphere and flow of the whole event, as well as to the environment and mood of your book. So, these are some basic tips and tricks on how to organize a good book launch event that I have learnt from my own experience of presenting the novel “The Monster: Blade of Darkness”, as well as from attending the events held by other authors. If you want to know more about this topic, you can always reach me through the Contact section of this website. In the next and final part of this series of articles I will write about the post-launch-event activities for promoting your masterpiece, following up with your community of readers, and making it grow exponentially. I wish you all the best in presenting your dream to potential readers! Some time ago I started the series of blog posts entitled “How to Publish a Book in the Digital Age” with the lessons about book writing and publishing during my experience with the novel “The Monster: Blade of Darkness”. In the first part of it I described how sharing of a dream of publishing a book through on-line channels and off-line social interaction might bring you valuable contacts and community to make this dream come true. And now I would like to continue with the next lesson on how you can capitalize on these contacts and community to test your dream of a book and bring you the necessary resources through a crowdsourcing and crowdfunding campaign. Lesson #2: Get Support through Crowdsourcing and Crowdfunding! Publishing a book is hard work that requires a number of different skills. Besides being the writer, you should also be able to proof-read it carefully, prepare good-looking illustrations, design the cover, develop an attractive and user-friendly website for it, make a promotional video, etc. Of course, if you have money, you can order all this as services delivered to you by professional companies. But if not? What if you do not have sufficient financial resources to pay for such services? A lesson that I had learnt during working on the book “The Monster: Blade of Darkness” is that you might be the author of the book, but it does not mean you should be its sole creator. There are many people out there, who would love either to contribute to such a wonderful dream or to show their own talents and apply their creative skills in practice. Involve them by sharing the ownership of the final result. 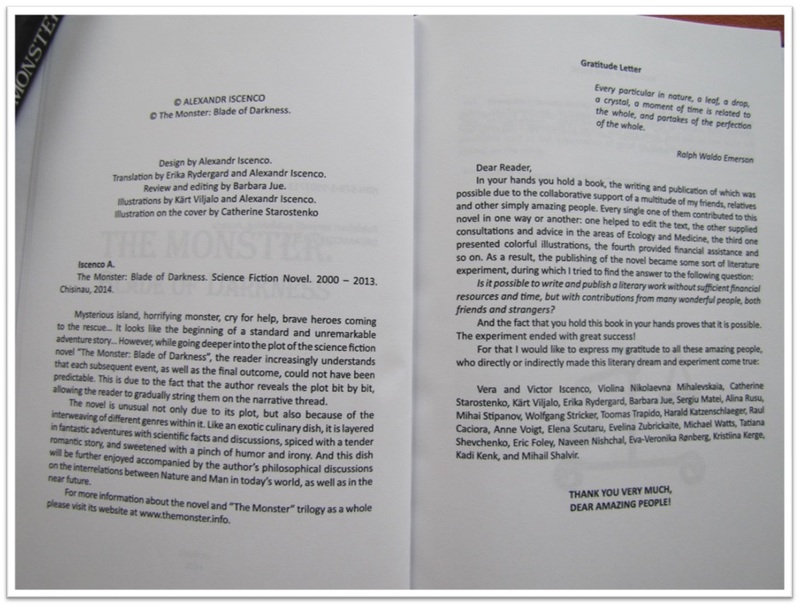 For example, in the case of the book “The Monster: Blade of Darkness”, it was translated, proof-read, and supplied with good-looking illustrations by a number of amazing supporters of my dream. In exchange I mentioned their names in the Gratitude Letter in the book and on the website and gave them their copies of the book for them to see the result of their talents and efforts and show it to their friends. The same thing I have done with supporters, who donated their financial resources through a crowdfunding campaign. Crowdfunding is a practice of raising micro-investments from a large community of people for realizing a certain project. These micro-investments can range from one euro to thousands of euros, but when collected from a large number of supportive people, the end sum can be quite significant. But getting financial resources is not the only advantage of crowdfunding. It can also be a test for your idea in terms of whether the readers would be willing to read it. By presenting your book-publishing idea in a crowdfunding campaign and inviting people to “pre-order” your future book, you can see how many will be willing to really do it. It is sort of a market test of your dream. However, do not be discouraged if there are no supporters and financial resources. The issue might be not in your idea of the book, but in how you present it. To be successful, the crowdfunding campaign requires professionally looking video, good-quality images of your creation, and convincing description of your dream. You can do all these things by yourself, but once again I suggest you to request support from your friends and colleagues, like I did with the video for my crowdfunding campaign. When the video, images, and text are ready, you can upload them to a crowdfunding platform. The most well-known and successful ones are Kickstarter and Indiegogo, but you can find the one focused specifically on your country and your target audience. Through some of them, like Indiegogo, you can receive the majority of the funds raised even through your campaign did not reach its monetary goal. 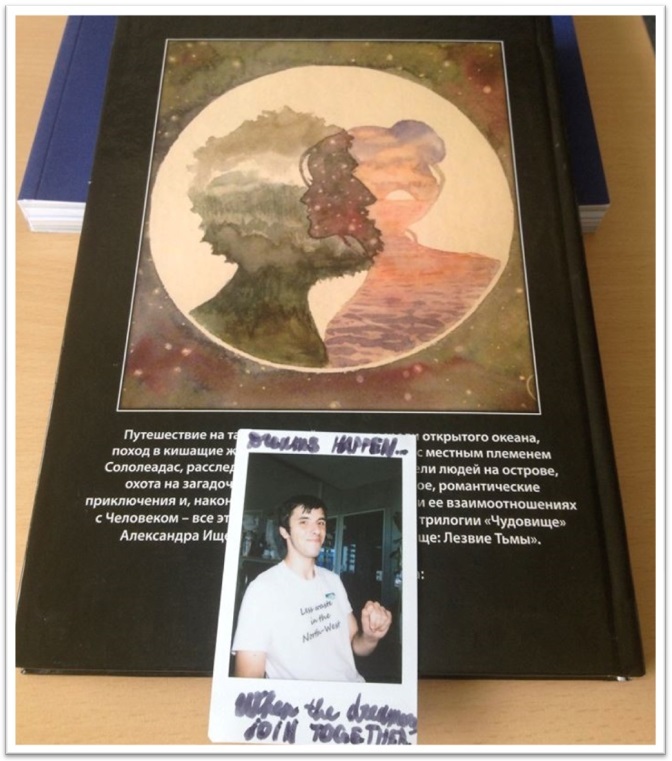 For instance, my campaign for publishing the book “The Monster: Blade of Darkness” did not achieve its goal, but it still brought me first readers and financial resources enough to get the first 300 copies of the Russian version released and distributed. Nevertheless, I still recommend you to be modest and not to set too high and overoptimistic crowdfunding goals. These are the main lessons about crowdsourcing and crowdfunding for making the book dream come true I have learnt. If you have more questions about this topic, you can always write to me by using the Contact section of this website. And in the next article I will describe how to organize that very important and memorable thing for every author – the book launch event. Best wishes in getting valuable support for your dream! Have you ever thought of writing and publishing your own book? 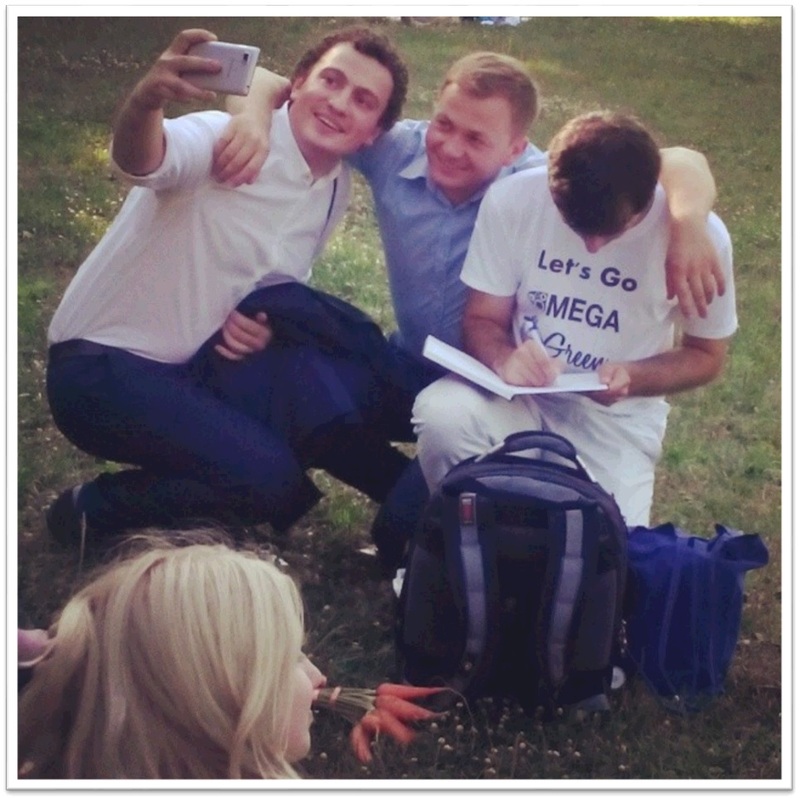 Would you like to experience that unique moment when you see people around you reading your book and getting excited and inspired from it? I know that at least some of you would reply to these questions with a definite “Yes!”, as there are people among you, who were inspired by the release of the book “The Monster: Blade of Darkness”. This fact makes me feel very happy, as I would love to read your literary works one day. And especially for such amazing people like you I decided to share some tips on how to write and publish a book in the modern digital age. Perhaps they will help you make your dream of publishing a book come true, as it has happened with me and my novel “The Monster: Blade of Darkness”. Nowadays the process of writing and publishing a book is undoubtedly different than it was just some years ago. I cannot say whether it is more difficult or easy, as some stages of the process can be done easily due to modern internet technologies, while others are more challenging to execute. The challenges are related mostly to the fact that, from one side not many people read books nowadays, and from the other side the competition on the international book market is quite big with new titles appearing every month worldwide. Well, to make things clear, I will not be able to give advice on solving all the challenges that you might face on your journey towards a released book. I will just share with you some lessons I had learnt while working on the book “The Monster: Blade of Darkness”. And I will do it step by step throughout a series of blog posts. So, here is the first one. Lesson #1: Share Your Dream! This is the lesson I had learnt only when I came to writing the final chapter of my novel. And I am certain that if I hadn’t learnt it and hadn’t acted accordingly, there would be no book “The Monster: Blade of Darkness” being sold in on-line bookstores worldwide. Because it was due to me talking about my dream and sharing the idea of releasing a book that I’d got connected to Wolfgang Stricker, the founder of serendii publishing, and who kindly agreed to publish and distribute the English version of the book “The Monster: Blade of Darkness”. Also revealing my desire and intention to write and release this book with my dear amazing friends allowed me to gather a community of supporters, who then helped me collect the necessary financial resources through a crowdfunding campaign. I will write about this campaign in the next blog post of the series “How to Publish a Book in the Digital Age”. Whether you are just thinking about a book, have started writing one, or already finishing its concluding chapter, do share about it with your friends and relatives. Spread the word about your dream. The digital age offers a multitude of tools to do it, like Facebook, Twitter, Google+, Pinterest, etc. Write about your vision of your own book on your personal blog. For example, in the blog post “Wish You MEGA Great Love!” I mentioned about my upcoming work “Simply Love”, although it is still far from being completed. Join special reading communities, like Goodreads, Book Blogs, etc. Let people know what you are doing and what you want to offer to them in the end. There will likely be a large number of people who will laugh at you and will try to discourage you from pursuing your dream. But there will definitely be some, who will appreciate your dream and will try to help you. Invite them to do it. And for their help you can (and should, I would say) mention them in a special gratitude message in the book and/or on its website, like I did in the case of “The Monster: Blade of Darkness”. Ultimately these amazing people will also become your most devoted readers and promoters. This is it for now. I hope you have found something useful for you in this short article. In the next one I will share with you how to get initial funds and first readers for your book through a crowdfunding campaign. Best wishes in moving forward with your dream!